Manav Rachna University’s -BBA (Finance & Accounts) Programme is integrated with US, CMA (Certified Management Accountant) to provide Professional Qualification and extensive career opportunities. Hospitals and ManavRachna University has signed an MoU to provide trained manpower in the Health Care sector & joined hands to bring structured BBA (Healhcare Management) programme. Purdue NExT of Purdue University, USA offers an interactive learning environment through online courses to UG & PG students. The Association of International Accountants (AIA) is a global body for professional accountants that train the MBA BBA (Finance & Accounts)students in building their knowledge so that they may excel in the field of accountancy. Royal Agricultural University, School of Real Estate and Land Management (RELM), UK has partnered with Manav Rachna for cutting edge pedagogy delivery for its MBA Programmes. An International Environmental Project With University of Tennessee, USA advocates the use of value based sustainability education in MBA and creates awareness of environmental and social issues while pursuing economic goals. 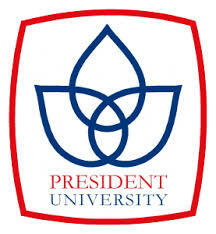 President University is a higher education institution in Indonesia which was established to become a research and development center in the region and to set a new benchmark in Indonesian higher education. Specifically, the university is prepared to create an institution of learning which would prepare future leaders of industry and society by giving them the skills and experience necessary to excel upon graduation. Manav Rachna University’s – Department of CST is offering B.Tech Computer Science & Engineering with specialization in Data Science & Machine Learning and Digital Transformation Engineering in association with Xebia.